Welcome to the Golden Mile! Take a walk down the Vegas Strip where the riches of Vegas Diamonds can be found. Hold onto your seat as you enter the triple wheel bonus game and see what fortunes can be won. This is where the action begins! Vegas Diamonds is a 3 reel slot with 5 paylines, and filled with exciting and rewarding features such as a Perfect Match locked twin reel respin feature, a Vegas Diamonds nudge feature, a triple fortune wheel and free spins. Reels 1 and 3 are also boosted with wild win multipliers ranging from 2 all the way up to 5, resulting in considerable wins. Identical symbols on reel 1 and 2 make these two reels lock into position for 3 respins while the third reel spins normally. The locking of the identical symbols significantly increases the player’s chances to win. The Vegas Diamonds symbol is the most valuable symbol in the game, the three Vegas Diamond symbols anywhere in view make the reels nudge to get all the three valuable diamonds aligned on the middle row. A really lucky hit with diamonds in the Perfect Match Respins might retrigger the nudge feature three times. 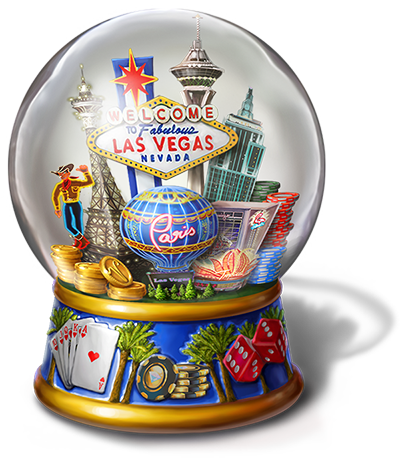 Three bonus symbols trigger the Vegas Diamonds Fortune Wheel with 3 guaranteed rewarding spins. Lucky hits take the player from the Bronze to the Silver and then potentially all the way to the impressive Golden Wheel. The size of the potential wins ranges from 100 times the bet on the Bronze Wheel up to the breathtaking 1000 times the bet on the Golden Wheel. Standing 7,6 meters tall, this world known landmark has welcomed visitors to Las Vegas since 1959. It was designed by Betty Willis and later sold to Clark County, Nevada. The famous white little wedding chapel in Las Vegas was established in 1951 and has married more than 800 000 couples. The ministers employed there has wed people like Frank Sinatra, Michael Jordan, Britney Spears, Bruce Willis and Demi Moore. With the millions of lights bulbs, billboards, neon signs and fireworks, “the entertainment capital of the world” Las Vegas is classified as the brightest spot on earth by NASA.